Well, I’ve got all of the buttons on the main menu doing something, and my last two dialogs (theme selection and options) are now in and working. Which means I now head into polish mode. The game has been functionally there for quite some time, and now I’ve got all of the menuing and UI support stuff finished. Typically, where I am at right now would be about as far as I’d go with a game. While I actually touched the real game code today (the stuff that actually contains game mechanics), it was a small change to support the options I put in. From here on out, it is all small, barely noticeable changes that take a lot of time and, truth be told, are really annoying and frustrating. For example, there is one tweak that will be necessary involving the menu button and how it initially shows up in internet explorer. IE and fox handle the “right” style a little differently, and making code that works in both is a little hackish. Another thing still to do is put in a “you win” dialog or something when the puzzle is complete. I’ve long since ditched the cheerleader, and I’m most likely to just go with a simple window popping up that states “you win! congrats!” and maybe show some statistics. For a while, I had toyed with the idea of completely ditching <img> tags everywhere, and strictly go with html tags <input> <button> <div> for my graphical elements. I could easily replace all of the images used on the board with <div>s, and the load time would be amazing, since there would be no images to download. I have decided not to go that route for this game (I’d like to be done someday, and this sort of constraint reminds me a bit of my ASCII graphics and hexagonal board fetishes, and nobody likes an eccentric game developer) . I’ve got a main menu dialog coming along for Connect! For some things, I’m going to be stuck with the inconsistent rendering of various <input> tags, especially text boxes and combo boxes. I’ll go as far as reinventing the wheel with simple controls, but not when it comes to complex controls like that. And expect it to work in IE. Fox likes it just fine. And yes, I know clever use of eval is discouraged, but I needed it! No, really! I needed to encapsulate the event handling mechanism for a DOM object, shunting the event to a different controller object! eval was the only way! Fixing the problem for IE caused a different problem for IE. I was calling a different event handler from one of my event handlers, but in the IE version of the event handler window.event.type is used, which caused a stack overflow. So, I took out the call, replaced with equivalent code, and moved on. It now works in both fox and IE, with the new navigator. I’ll upload it after I’ve gotten a few more kinks out. I had my wife play the game with the new navigator, and the only part that she did not find intuitive was my “revert” button. 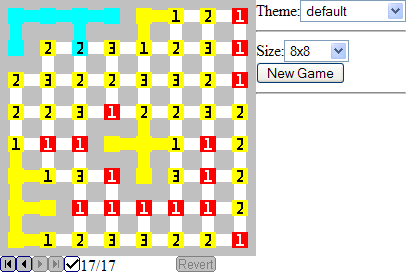 I had originally designed it so that if you were looking at a historical view of the game (by using the previous move or previous mark buttons), making new moves was not allowed (because it would mess up the rest of the history), so I made a “revert” button to restore the game to that point in the history. Except that it turns out that the natural inclination of a player is to back up to the point they want, and then just start making moves. I didn’t want to just make an auto-revert when making a move, because that might be a mistake on the part of the player. However, I it was clear that the revert button wasn’t the right solution, so I left the revert button in (although I’ll likely take it back out) and made a prompt if the player decides to make a move when looking at the history. This way, I prevent mistakes on the player’s part by being too hasty with a move while scanning the history, but I also don’t frustrate the player with unintuitive controls. In the next few days, I should have it updated on the site, and I should have an updated feature list left to implement. I’m feeling it start to take some of its final shape at last. Here you can see the new navigator controls on the bottom of the screen. I like the new scheme a lot better than the old one. This evening, I was able to knock out features 2, 10, and 12. There is now a winning animation that uses some cheerleader icons from IconBuffet. The load time is pretty much instantaneous now. The player now has the ability to save the state of his game and later restore it. As you can see… not much there. All of the work is done in the JS files. All of my layout stuff is in the scripts in scripts/common. Typically, when I am building a page in this manner, I build up a string filled with HTML, and at some point find an object in the DOM and set that objects innerHTML to the string I generated. When I started putting together Connect! (which actually began as a Yahoo! Widget, which is why I made some of the architectural decisions I did), I instead APPENDED strings with HTML to the innerHTML of my main <DIV>. For a Connect! board with 64 nodes, 56 vertical connectors, 56 horizontal connectors, a background image, a cheerleader image, and 6 buttons, thats close to 200 DOM objects getting inserted, one at a time, into another DOM object. No wonder it seemed to take forever to load. So, I switched the code so that it instead build up a string as it went, and only put the objects into the DIV at a single time. The result: nearly instant load.